Did you pay attention to Facebook’s third quarter 2015 earnings report? But as the largest social media network in the world, what Facebook does matters to your marketing and your company, including SEC required reporting. Participants spend 20+ minutes per day on Facebook. 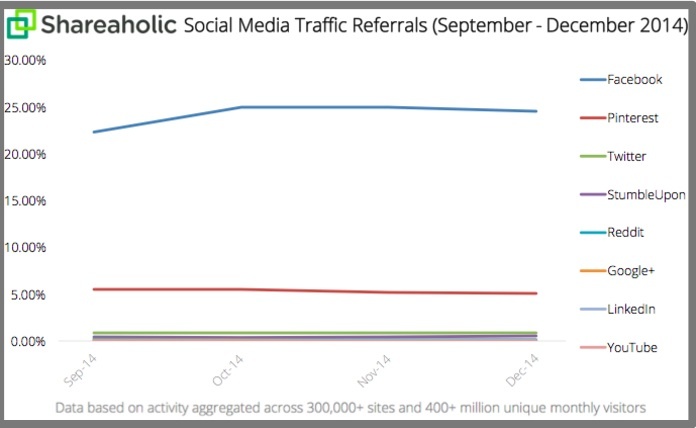 Facebook sends 24% of all referral traffic based on Shareaholic’s 300,000 websites. 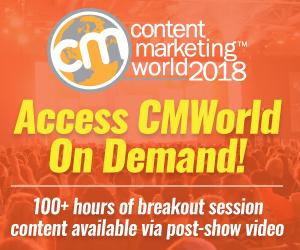 84% of B2B marketers use Facebook to distribute content (30% find it effective) and 94% B2C marketers use Facebook to distribute content (66% find it effective). 1 billion people use Facebook on Android devices. 80 million photos per day are shared on Instagram. 1 in 5 of minutes people spend on their phones per day is with Facebook and Instagram. 5+ billion photos are sent on the Facebook Messenger chat app. 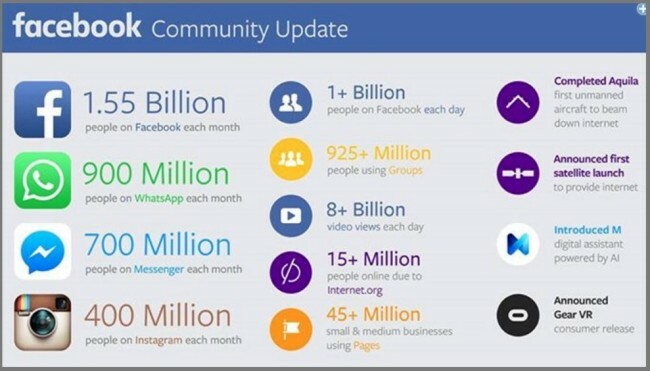 Here’s what marketers need to know from Facebook’s third quarter 2015 earnings report. As a point of comparison, here’s an analysis of Facebook’s 2014 results. 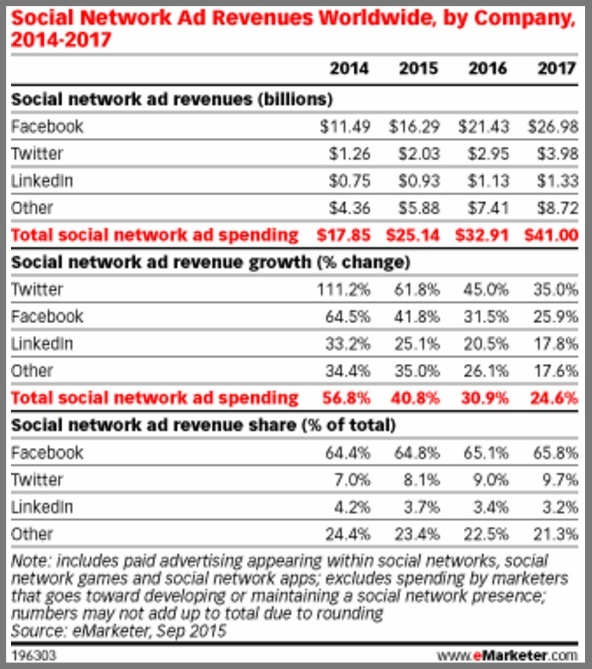 Facebook’s revenues are mainly advertising based. Therefore, they’re strongly associated with audience growth and composition. They focus on reporting DAU (or daily active users) and MAU (or monthly active users). 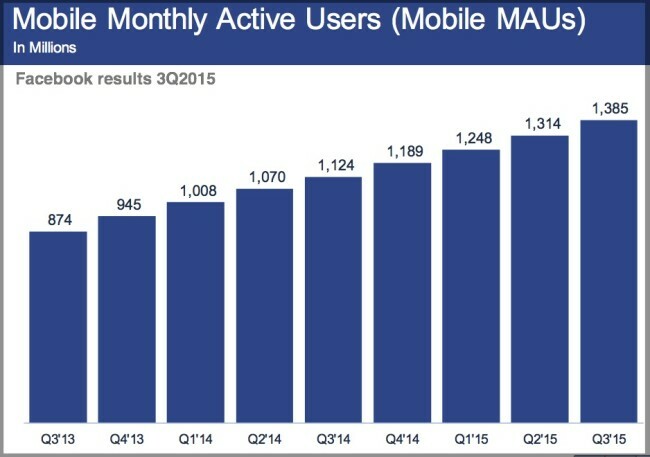 Facebook’s MAU growth rate has declined since 2011. This makes sense since its audience growth is limited. Facebook has penetrated every age demographic and geography except China where it faces legal challenges and native options. 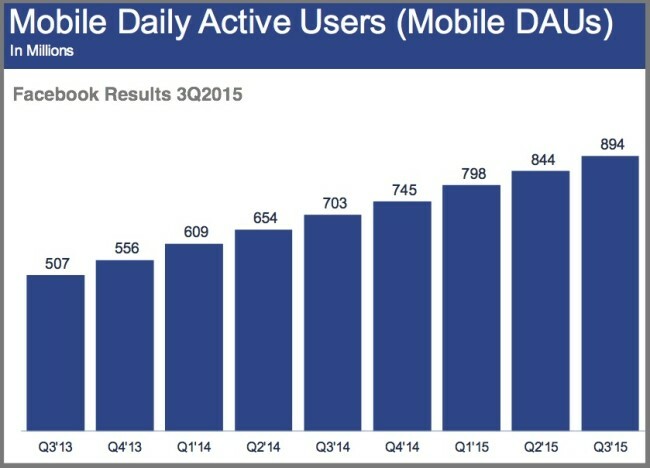 In their 3Q2015 report Facebook changed their monthly active user (or MAU) definition. This reduced their audience numbers. We define a monthly active user as a registered Facebook user who logged in and visited Facebook through our website or a mobile device, or used our Messenger app (and is also a registered Facebook user), in the last 30 days as of the date of measurement. 1.01 billion DAUs on average for September 2015, up 17% year-over-year. 894 million mobile DAUs on average for September 2015, up 27% year-over-year. 1.5 billion MAUs as of September 30, 2015, up 14% year-over-year. 1.3 billion mobile MAUs as of September 30, 2015, up 23% year-over-year. 1.39 billion of Facebook’s 1.55 billion MAU access the site via mobile. 1 out of 2 mobile users is mobile-only. Specifically, 727 million MAUs are mobile-only users, up 37% year-over-year. This audience is most likely located in emerging markets, where people primarily access the Internet via smartphones. But users beware! The Facebook app can drain your iPhone’s battery unless you update it. Note: Facebook results don’t include Instagram or WhatsApp users unless they would otherwise qualify as such users. 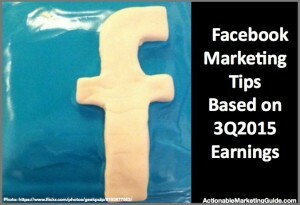 Most of Facebook’s revenues come from a combination of impression and click-based ads. Facebook’s other revenues include fees for virtual and digital goods. Revenue was $4.50 billion, up 41% year-over-year. Other revenue from payments and other fees was $202 million, down 7% year-over-year. 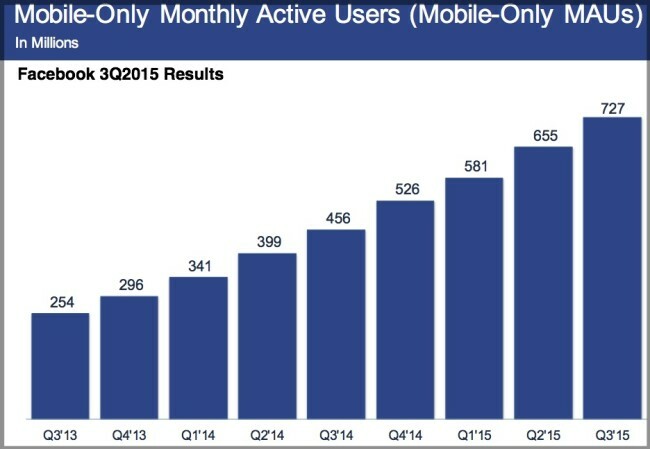 3 out of every 4 dollars of total 3Q2015 Facebook ad revenue came from mobile (specifically 78% of 3Q2015 ad revenue). Facebook ad revenue grew due to increased News Feed ads on mobile devices. Mobile advertising costs more than desktop advertising. Increased ad inventory demand. Partially due to more marketers actively advertising on Facebook. Increased mobile user growth and engagement. Increased number and frequency of ads displayed in News Feed including the quality, relevance and performance of those ads. 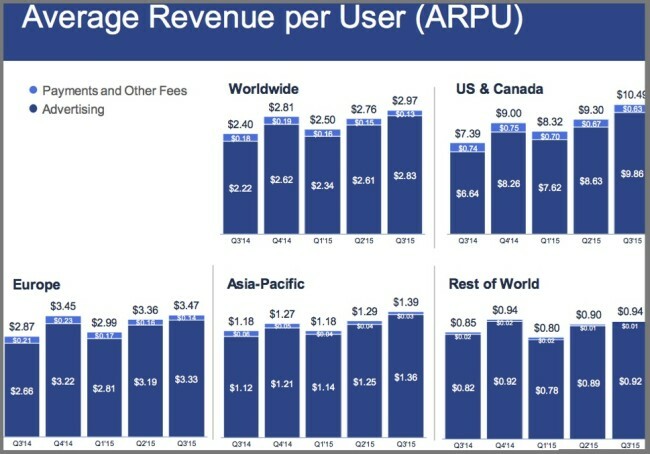 Facebook’s average price per ad increased 61% from 3Q2014 to 3Q2015. A product change to certain non-News Feed ads in 3Q 2014 increased the average price per ad. As a result, the ads displayed decreased while each ad’s prominence increased. Facebook ads impressions delivered decreased 10% from 3Q2014 to 3Q2015. This reduction in ads delivered reflects the shift towards mobile device usage where people see fewer ads than on a PC. 2.5 million advertisers are active on Facebook. Most of Facebook’s revenue comes from North America and Europe where average revenue per user is $10.49 and $3.47 respectively. Asia-Pacific and the rest of the world yield average revenues per user of $1.39 and $0.94 or 25% or $1.1 billion in total. Yet these regions account for 65% of Facebook MAUs. The problem: Video ads have the potential for generating overrated views. Facebook defines a video view as someone who sees a video for at least 3 seconds. Facebook videos start playing as soon as they scrolls into the newsfeed. On YouTube and other services, a video must be manually started before it’s counted as played. As a result, Facebook video view numbers tend to be significantly higher than the number of people who actually watch them. 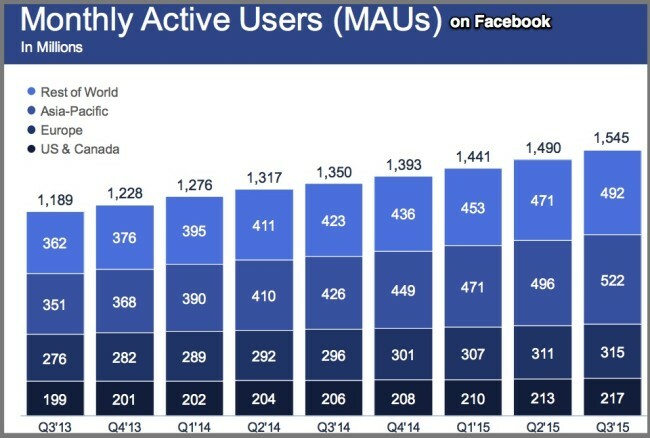 Facebook has 8 billion video views per day, twice the 4 billion daily views reported in April. 5+ million small businesses posted a video on Facebook using organic posts and ads in September 2015. 500 million users watch videos on Facebook every day (according to Bloomberg via Business Insider). If this is true, people who watch videos, view a lot of them. Further, those videos are likely to autoplay. M is Facebook’s virtual personal assistant launched this summer in limited beta in its Messenger chat app. It’s a combination of AI (artificial intelligence) and people. The goal: Make Messenger the first mobile stop in information discovery challenging Apple’s Siri and Google Now. It has the potential to increase revenues through a share of purchase activities. “Duplicate” Facebook accounts represent less than 5% of 2014 worldwide MAUs. Facebook defines a duplicate account as another account maintained by a user in addition to his principal account. As long as the account holders actively use these accounts, they’re less of a marketing problem. “False” Facebook accounts represent less than 2% of 2014 worldwide MAUs. User-misclassified accounts where users have created personal profiles for a business, organization, or non-human entity. These entities should have a Facebook Page, not a personal profile. Undesirable accounts represent user profiles Facebook determines are intended for purposes that violate its terms of service, such as spam. Facebook’s revenue and investment priorities are as follows. Continue capitalizing on the shift to mobile. Includes expanding Instagram ads. Get more marketers to use Facebook ads, especially video. Make Facebook ads more relevant and effective with new ad formats and tools. Core products and services to better serve its communities and businesses. Next generation services. Includes Instagram, WhatsApp, and Messenger. Long-term innovation efforts. Includes Internet.org and Oculus Rift’s consumer version. Reduce organic reach. This has been a classic Facebook move to force marketers to pay more for ads to target prospects. 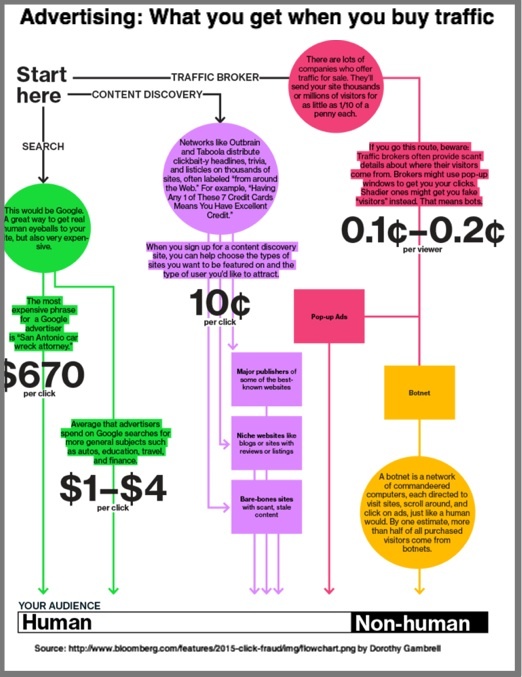 Increase ad prices based on demand. 2015 results reveal that Facebook already does this. 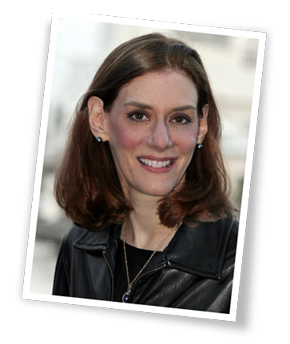 As part of this effort, Facebook can create or expand premium audiences. At The Economist, I used this tactic to increase the number of business readers to meet demand and increase revenues. Add advertising to products where it doesn’t exist. The challenge is users may complain and targeting may be difficult. Continue to test new products to extend share of audience time. As a result, advertising and revenue shares will increase. Based on Facebook’s 3Q2015 earnings, here are 10 Actionable Facebook Marketing Tips to keep your overall business plans on track to succeed. Know your Facebook audience. Create a social media persona. Focus on the topics your followers find interesting on Facebook. Check BuzzSumo. Put your Facebook postings into context for your viewers. Like other social media, photographs perform better than text, especially happy people. Avoid stock images. Also, optimize your headline for Facebook. Encourage employees to share your company’s content via their personal accounts. Extend your Facebook reach by tapping into personal accounts. Always include a call-to-action. Don’t assume Facebook participants will know what to do next. Get your Facebook audience to connect with you off of Facebook. Protect against future Facebook changes. Entice readers to register for your emailing or to purchase from you. Offer them something they find of value. Track your Facebook results. Monitor the effectiveness of different Facebook activity to contribute to your goals. Continually test what works. Find out what performs best for your specific Facebook audience. Keep trying to improve your results. Support your Facebook activity with advertising budget. This is more important for B2C businesses. Diversify your social media activity. Don’t just focus on Facebook. Use owned and other social media networks. 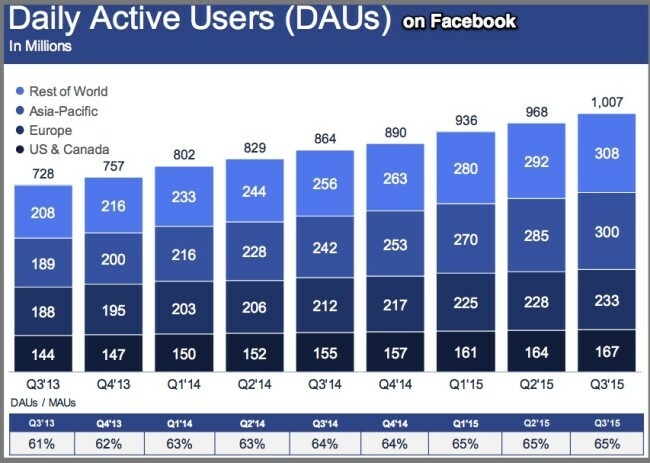 Facebook continues to dominate the social media landscape. Since Facebook’s revenue streams aren’t diversified, expect the social media giant to keep reducing organic reach and charge more for targeted advertising across devices and formats. As a marketer, allocate budget, both people and money, to your Facebook strategy including content, participation and advertising. Align your Facebook marketing with your overall marketing and business plans. While you need to focus your marketing efforts, diversify your social media activity to ensure that you’re not at risk of losing a large share of your traffic due to a Facebook change. What’s your favorite Facebook tactic and why? 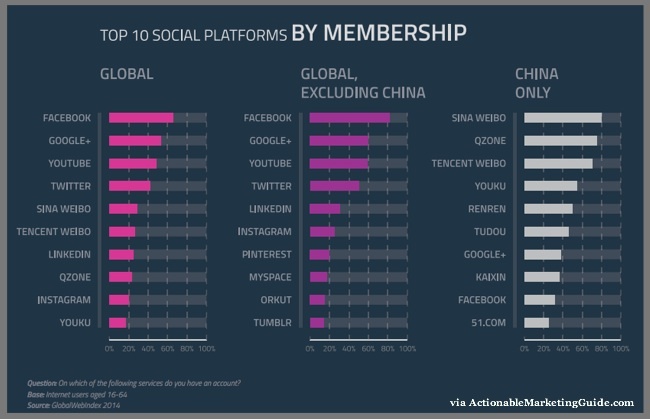 Tags 3Q2015, Chart, Facebook, Instagram, Video. Bookmark the permalink.